Tips for Food Quiz Pack 9 Answers to help guess the food name using category of snacks, beverages, candy & gum, dairy, breakfast and cartoon of food picture with missing logo & shape ! 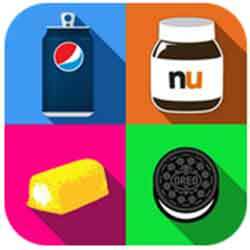 Food quiz app game by Guess It Apps that you an play on android and ios iphone, ipad. Food Quiz is the ultimate food quiz game on Android! With over 200 items and growing, Food Quiz has the largest collection of worldwide food to test your food trivia knowledge.